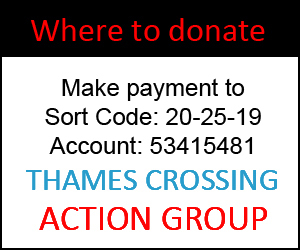 Donations to Thames Crossing Action Group are much appreciated and help us to continue the fight against Option C of the Lower Thames Crossing. If you wish to support TCAG and the campaign please make your payment direct to the Thames Crossing Action Group bank account. This means of donation replaces the original GoFundMe campaign which has now been closed, and funds transferred to the new bank account. In the immediate future these funds help us to produce leaflets to promote Community Meetings, hire venues for the meetings, and keep this website online. 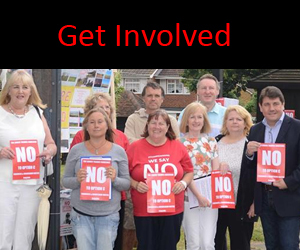 In the future we may also need funds for legal representation and the like, so every donation is appreciated and will be used to help the campaign against Option C of the Lower Thames Crossing. Thank you.